Beginning in May 2016, the world’s largest wastewater treatment facility, the Stickney Water Reclamation Plant (WRP), became home to the world’s largest nutrient recovery facility, and the impact of its cutting-edge technology will reverberate almost 1,000 miles away. The Metropolitan Water Reclamation District of Greater Chicago (MWRD) owns and operates the Cicero, IL-based plant. Governed by a nine-member Board of Commissioners, an executive director leads almost 2,000 employees who maintain the Stickney WRP and six other plants, along with 22 pumping stations, 35 flood control and detention reservoirs, 560 miles of intercepting sewers and force mains fed by approximately 10,000 local sewer system connections, and 76.1 miles of navigable waterways. Stickney itself is home to nearly 400 employees. The Stickney WRP serves 2.3 million people in a 260-squaremile area, including the central part of Chicago and 46 suburban communities. It encompasses 413 acres and treats up to 1 million gallons of water per minute, the equivalent of pumping two Olympic-size swimming pools. On average, the Stickney WRP cleans 700 million gallons of water per day with the capacity to treat up to 1.44 billion gallons per day. The plant was constructed in two phases; the west side of the plant was placed into service in 1930, followed by the southwest portion in 1939. From the time raw sewage enters the plant, it takes about 12 hours to process, clean, and release the water to the Chicago Sanitary and Ship Canal. The process has evolved since the MWRD was formed in 1889 as the Sanitary District of Chicago. From its first directive to eliminate pollution in Lake Michigan, the source of the area’s drinking water, the MWRD’s mission expanded to improving the local water environment through the construction of its many facilities and water treatment operations. The MWRD pursued and received statutory authority to provide stormwater management services for Cook County in 2004. In the ensuing years, the mission has evolved even further — to recovering critical resources from what was previously considered waste. Excess phosphorus is the limiting nutrient in fresh water across the globe and can threaten to endanger the water environment. Phosphorus enters bodies of water from a number of sources, including urban water treatment facilities. Excess phosphorus in waterways can cause algae to grow and bloom, creating toxic conditions that threaten aquatic life and severely limit recreational enjoyment of lakes and rivers. As a result, the U.S. EPA has mandated that the state of Illinois reduce phosphorus runoff in receiving streams by 45 percent. By implementing nutrient-reducing technologies at its three largest plants (Stickney WRP, O’Brien WRP in Skokie, IL, and the Calumet WRP on Chicago’s South Side), the MWRD will achieve 20 percent of the state’s reduction goal by as early as 2017. As a water industry leader, the MWRD seized the opportunity to lead the nutrient-reduction effort. Accordingly, these factors led the MWRD to implement an effective phosphorus management strategy and hire Black and Veatch to construct the $31 million facility. 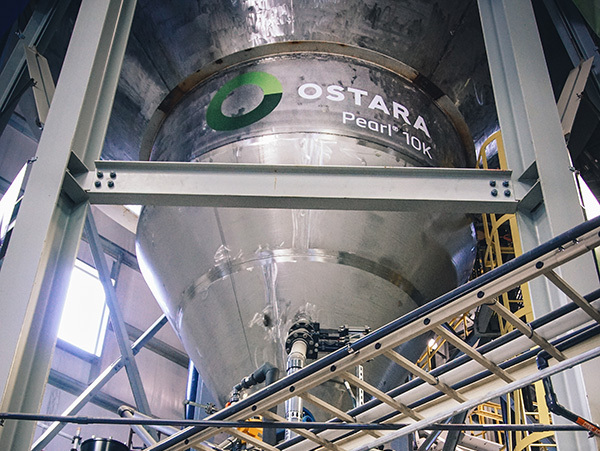 The MWRD explored an array of nutrient recovery alternatives before selecting Ostara’s Pearl® process. The Pearl process provides a closed-loop solution that recovers phosphorus and nitrogen to form a high-value fertilizer that generates revenue for wastewater treatment facilities while helping meet environmental regulations. Traditionally, when wastewater treatment plants remove phosphorus from their discharge stream, the nutrients are recycled into their system, creating struvite. Struvite not only clogs pipes and valves, which reduces flow, but requires costly maintenance. Although chemical additives can temporarily relieve struvite problems, it is a costly solution that also generates solid waste that requires disposal. The MWRD installed three Pearl 10000 reactors with a production capacity of up to 10,000 tons of a high-value, continuous-release fertilizer product per year that will be marketed and sold as Crystal Green®. Every ton of Crystal Green produced will be purchased by Ostara, which will share the revenues with MWRD from the sale of Crystal Green to buyers in the turf and agriculture markets; the MWRD expects the revenue to exceed operational costs. In addition, the facility will benefit from cost savings in chemicals, solid waste disposal, maintenance, and power. Following the successful commercial startup of this facility, the MWRD plans to implement WASSTRIP®, a process that turbocharges the nutrient recovery process and increases the amount of phosphorus recovered by more than 60 percent. As a result, the efficiency of the Pearl process will be further enhanced to decrease the magnitude of struvite scale formation and alleviate operational issues. Treatment at the Stickney WRP includes coarse screens, fine screens, grit removal, and primary treatment (gravity settling that removes readily settle-able solid material) followed by secondary treatment (activated sludge) and then discharge to the Chicago Sanitary and Ship Canal. For solids, primary sludge is screened and concentrated utilizing gravity concentration tanks, and waste activated sludge is thickened utilizing centrifuges. These solids streams are combined and anaerobically digested. Some of the digested sludge is currently sent to solids storage lagoons for aging. The remainder is sent to centrifuges for further dewatering (to approximately 25 percent solids). These solids are sent to multiple outlets: a pelletizer facility, farm land application, solids lagoons for aging, or solids drying areas for air drying. The aged solids from the lagoons are further air-dried on solids drying areas prior to beneficial reuse. Various recycle streams (centrates) from the many processes are returned to the headworks of the WRP. The phosphorus recovery facility is tied into the recycle streams of the centrifuges. It will initially accept post-digestion centrifuge centrate, and at a later date when the MWRD has designed and implemented the WASSTRIP technology, the facility will also accept predigestion centrifuge centrate. The Pearl process can recover more than 85 percent of the phosphorus and up to 15 percent of the nitrogen from wastewater streams before they accumulate as struvite in pipes and equipment. The MWRD’s new nutrient recovery facility is an example of how progressive technology can be implemented to transform a wastewater treatment facility into a resource recovery center, providing significant environmental benefits to the Chicago Area Waterway System and downstream to the Mississippi River and the Gulf of Mexico. The fertilizer byproduct is both economically and environmentally viable. Removing phosphorus from the water and reusing it for agricultural production represents a significant shift in the wastewater industry from treatment to recovery for reuse. While the reduction of phosphorus in the water flowing downstream to the Gulf of Mexico is a major achievement, it is the local result that excites visitors and residents of Chicago on the one hand and agricultural communities on the other. Interest in the Chicago River and area waterways is at the highest level it has ever been; in response, riverwalks are being constructed, economic development within surrounding neighborhoods is booming, and recreational use has skyrocketed. In the meantime, phosphorus is a valuable, but nonrenewable, resource; it is an essential element for plant growth, and high-yield agricultural production relies on a perpetual supply of it in fertilizers. Unfortunately, it is in dwindling supply due to the expansion of high-production agriculture worldwide. To meet this important need, Ostara will market and sell Crystal Green to a global network of professionals in the agriculture, turf, and horticulture markets. Presently, Ostara is working to market Crystal Green to Illinois farmers, closing the phosphorus loop. The facility will have the production capacity to grow 1 billion pounds of potatoes — or 250 million bags of potato chips — annually. By placing a critical eye on the bottom line, the MWRD’s Stickney WRP has transformed a harmful consequence of its processes into a revenue-producing product. This investment in the phosphorus recovery facility will also go a long way toward protecting the entire planet, while influencing others to embrace this exciting technology. The MWRD is taking a diversified approach to addressing nutrient removal from wastewater. In addition to the production of the Crystal Green product, the MWRD modified the wastewater treatment process at the Stickney WRP last year to incorporate a process called Enhanced Biological Phosphorus Removal (EBPR). The EBPR process carefully controls conditions in the aeration reactor to cause the microbiological organisms in the reactor to uptake more phosphorus than normal. When the organisms are digested in the anaerobic digesters, they release the phosphorus. The phosphorus then ends up in the Crystal Green product and in biosolids, which are applied to the land as a soil amendment, thus returning the phosphorus to the land. Although the EBPR process is complex to control, it is a more sustainable approach than traditional methods of phosphorus removal that use inorganic chemicals to bind to the phosphorus and remove it through precipitation. Another approach to nutrient removal that the MWRD is pursuing involves the natural uptake of phosphorus and nitrogen from water to support the growth of algae through photosynthesis, utilizing the sun as its energy source. This same approach can be applied to wastewater treatment as a means to remove nutrients from the waste stream without the use of inorganic chemicals or energy-consuming aeration, which is the traditional means of nutrient removal. The algae can then be harvested and utilized as a raw material in the manufacture of a variety of products, such as biofuels and bioplastics, which will also reduce the reliance on petroleum. The algae can also be composted with biosolids and land-applied as a soil amendment, digested to produce biogas, or processed as aquaculture feed — all of which return the phosphorus to the nutrient cycle. The concept of using algae to remove nutrients from wastewater is not new. However, traditional approaches that use large algal ponds are not practical in an urban environment where land is scarce. As a result, the MWRD is conducting leading-edge research in this field to help make algae nutrient recovery technology a practical and sustainable approach to nutrient management for urban wastewater treatment plants. Also underway is the implementation of AnitaMox™, a deammonification process that will significantly reduce the concentration of ammonia-nitrogen in a high-ammonia concentration sidestream at the Egan WRP in Schaumburg, IL. This process fosters the growth of specialized bacteria that convert the ammonia into nitrogen gas in a way that can save 2 million kWh annually in energy consumption versus the current ammonia treatment method that uses aeration. This process is a step toward the MWRD’s goal of implementing deammonification technology for mainstream application. If successful, this process will completely change the way nitrogen is removed from wastewater and will conservatively reduce energy usage by 40 percent, saving 120 million kWh annually — the equivalent energy provided by 15 utility-scale wind turbines or enough energy for 4,500 homes.